Hi, I am interested in your 1986 Oldsmobile Cutlass Supreme Salon Coupe (stock #4680-ATL) listed on Autotrader for $23,995. I'd like to get more information about this vehicle and confirm its availability. This 1986 Oldsmobile Cutlass is one stylish classic coupe. Its unusually well preserved both inside and out and has been driven a mere 9,000 miles during its lifetime - well under a years worth of service by most standards. Having also received a lot of doting maintenance its ready to provide plenty of future driving enjoyment, with a level of turnkey road-readiness not easy to find in a car of its era. You dont often see a car more than 30 years old that hasnt seen the inside of a restoration shop yet still looks this good. This Olds is a survivor in the best sense of the word - thriver might be a more apt term. Its original paint is still very strong and a brief buffing session will have it looking its absolute best. While its certainly no land yacht, its generously proportioned in both front and back and its spacious cabin is capped by a very fresh vinyl top that shows no bubbling while sporting one of the coolest styling cues of its era - that pair of vertically positioned opera windows in back. Theres a nice array of chrome also on board and all of it appears to be in great shape as well - check out those rocker panels running along the bottom portion of the car. The gray interior has been a major beneficiary of this Oldss light usage - we see our share of well-preserved cars from this era, but rarely as fresh as this one, as there really isnt any wear to be found inside the doors. The plushly padded front buckets still look much as they did when new as they bracket a center console sporting a stylish woodgrain accent around its shifter, and the matching carpeting below shows no signs of any mishaps of note. Owing to the Cutlasss appreciable cabin size, theres plenty of legroom in back and the rear bench seat offers sofa-like comfort. Additional features include air conditioning thats blowing as cold and strong as you could want, a tilt column, cruise control, power windows and door locks and an AM/FM/Cassette stereo to add a period appropriate audio experience while youre behind the wheel. The spacious trunk area is in great shape, with a healthy looking spare stored off to the side in its proper upright position, and clean carpeting lining its floor. This Oldss vintage 80s stylishness comes at no expense to rock solid drivability. Needless to say, the 5.0 liter V8 under the hood has logged so few miles that its just now in its prime and since time itself can potentially extract its toll if left unchecked, quite a number of steps were taken to keep this coupe in top running condition. The carburetor sitting just underneath the pristine factory air cleaner was recently rebuilt, along with the entire smog system and the intake just below it was removed, thoroughly cleaned and resealed. In order to thwart any potential corrosion, the radiator has been re-cored and in the process, the thermostat was also replaced to ensure optimal functioning. The powerplant pairs with an automatic transmission that shifts with slip free precision. Smooth power steering makes for easy navigation while power brakes that feature discs up front provide dependable, fade-free stops as this styish cruiser rolls on its set of 14 stock wheels outfitted with Uniroyal Tiger Paw tires. A look below will reveal that the undercarriage is just as well preserved as the rest of the car. 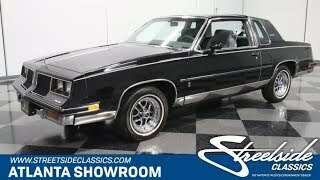 This 1986 Oldsmobile Cutlass is as ultra-clean a representative of its era as youre likely to find and its classic style pairs with an outstanding level of road-readiness to make for an unbeatable combination. Call today!